Five (stylised as 5ive) are an English boy band. They were formed in 1997 by the same team that managed the Spice Girls before they launched their career. The band were mostly known as a five-piece, consisting of Robinson, Neville, Conlon, Abz Love and Jason “J” Brown. Five enjoyed remarkable success worldwide, particularly in the United Kingdom, most of Europe, and Asia. The group have sold a minimum of 1.5 million albums and 2 million singles in the UK alone. They split up on 27 September 2001 after selling 20 million records worldwide. Robinson, Love, Neville, and Brown briefly reformed the group without Conlon (who left the band before their 2001 split) in September 2006. Eight months later, having secured a lucrative tour but failing to gain enough record company interest, Five made an announcement via their official website that they would again disband. In 2012, the band announced that they were planning another reunion, this time with Conlon on board. Lead singer Brown initially agreed to take part in the reunion, but later changed his mind, claiming that he no longer wanted to be in the public eye. The group continued with only four members, but decided to keep the name Five. Alongside Blue, 911, Atomic Kitten, B*Witched, Honeyz and Liberty X, Five were featured in the ITV2 documentary series The Big Reunion, which began airing on 31 January 2013. This was followed by a comeback performance at the Hammersmith Apollo on 26 February 2013 and an arena tour around the UK and Ireland in May, which was their first ever tour without Brown. 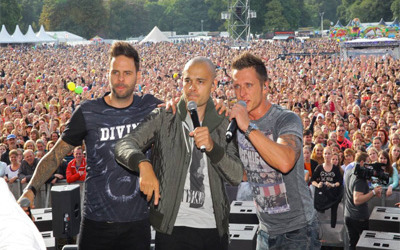 In November and December 2013, Five headlined their own tour, the 5ive Greatest Hits Tour, their first solo tour as a four-piece. In 2014, they are still touring.